When polluting the minds of the locals, make sure to use the occasional religiously based allegory. It works especially well while discussing minor points of their stated pacifism with a leftist anarchist throwing a chair through a plate glass window. Ex. : “wouldn’t it be better to teach a man to fish?,” and that sort of thing. Also ask them why there is no explosion of enthusiasm when there is a broadly publicized murder in the US, a nation of 300 million people, and no call to “understand the vast majority of peaceful Americans” when so many “social commentators” are prepared to claw each others’ eyes out to be the first to mention “the vast majority of peaceful muslims” when, say, a huge ugly mob marches after coordinated Friday sermons in Pakistani mosques or a nun gets shot? Incidents like this allow the MSM to ram home another of the chattering classes favourite points, namely the evil of guns. Hell, the only way they could have worked themselves into more of a self-righteous snit would be if the killer had been driving round the school in a 4x4. The funny thing is that the same MSM which claims that the gun is at the very centre of US culture, act as though the Koran and the Hadiths are just a set of vague suggestions, completely unrelated to any current events, in fact hardly worth bothering with at all. The authors of General Leonardo will be signing their graphic novel at the Lire en Fête festival this weekend. Erik Svane et Dan Greenberg dédicaceront leur nouvel album au Palais de la BD ce weekend. Two-faced, fork tongued, double language speaking Tariq Ramadan. Ramadan has a large following among Western touchy-feely types. Ramadan declared on French State TV that the continued stoning of women (a method approved of by his Islamist activist brother, for example) should be subject to a moratorium and debated before the oumma, Ramadan waffling something to the effect that without a debate led by Muslim authorities, any condemnantion of such practices would be moot. Apparently, it is politically correct for Ramadan to insinuate that Muslims are bloodthirsty, simple minded savages that require education from enlightened beings. Recordings of Ramadan's incendiary speeches, spoken in Arabic, are best sellers in the France's suburbs and rank right up there with Daniel Pearl and Nick Berg snuff videos as the most prised elements of French youth popular culture. 2 000 000 visits, and still no offers to join the editorial board of Socialist Worker newspaper. All three of us extend our thanks to our readers, especially the alumni and, um, imaginative commenters. Now is the time at ¡No Pasarán! when we dance. "PAS DE NÈGRE À ESPIRAT, PREMIER AVERTISSEMENT"
While racist actions in America would be comdemned hysterically in the harshest of languagues (smugness, snorts, sputtering, shouting, mockery, etc), lawyer Gilles-Jean Portejoie's reaction is of the typical hand-wringing, mortified, explanatory (there's-some-kind-of-explanation) kind when and where the Europeans themselves (like this… assistante maternelle (!) at a lycée) are concerned ("Cette affaire est révélatrice d'un climat, pense celui-ci, la déshumanisation touche aussi le tissu rural, et le racisme pousse sur ce terreau"). "LES NÈGRES AU BÛCHER, DEUXIÈME AVERTISSEMENT"
What I picked up from the Monde article, far from uninterestingly (and which I am not sure that Davet himself noticed), is that part (most? all?) of the resentment seems to have come from François Philippe's enthusiasm, individualism, can-do attitude, and work ethic. Venu d'un village voisin, François Philippe construisait, seul, sa maison, depuis 2002. A mains nues, un peu à l'écart de la départementale qui traverse Espirat. Charpente, menuiserie, plomberie, électricité, il s'occupait de tout. C'était son rêve, son bonheur promis, pour héberger sa deuxième femme, Véronique, et Clément, né d'un premier mariage. … François Philippe continue à bâtir son rêve, pierre après pierre, la maison sort de terre, le couple et l'enfant s'installent dans les chambres. Chaque week-end, chaque soir, l'homme travaille sur le chantier. Il choisit les meilleurs matériaux. En guise de poutres, il achète de gros rondins à Saint-Flour, qu'il fait sécher pendant trois ans avant de les placer avec soin, dans le salon. "Je n'ai pas pris de vacances pendant trois ans, ni ma famille d'ailleurs. Cette année, seulement, on a réussi à partir une semaine, à Noirmoutier." No wonder they fire-bombed his house. Listen to those bedwetting leftists for once, man! Don’t you know that You can’t hug kids with nuclear arms? Slobodan Milosevic pales beside Saddam Hussein, so why has smug anti-Bushism replaced reflection? writes Roger Cohen in the International Herald Tribune. For this new European left, confronted by such monstrous abuse on their own continent, the case for military action was clear enough. In Kosovo it went ahead without a clear United Nations mandate. But such sentiment vanished at the gates of Baghdad. Having covered the wars of Yugoslavia's destruction, I'm as vehement in my sentiments about the late Serbian strongman, Slobodan Milosevic, as anyone, but I would have to concede that he pales beside Saddam Hussein. In the scale of the destruction he unleashed - from the war with Iran, through the gassing of the Kurds, the slaughter of the Shia, and the invasion of Kuwait - Saddam was the Pol Pot of the Middle East. His monstrous regime, built around a personality cult, random murder, and the iron discipline of the Baath Party, rivaled the worst totalitarian inventions of the 20th century. Indeed, it was openly modeled on them. By comparison, Milosevic's Serbian Socialist Party was a trinket. And yet, with a few exceptions like André Glucksmann and Bernard Kouchner and, yes, Tony Blair, the left-of-center liberal, interventionists found Iraq to be a step too far. Back came the tired arguments about the countless tyrants on the planet and how you can't make it your business trying to oust them all. Why did the Sarajevo-Kosovo wave stop at Baghdad, leaving the European left to congratulate itself on being antiwar as it compared notes on who could express more derisive hatred of President George W. Bush? But given that this war also ended a regime of unrelenting terror, why have Europe's liberal interventionists lost their voice? Why is there no self-analysis, no explanation of the fact the road from Sarajevo to Pristina stopped short of Baghdad? Why has smug anti-Bushism replaced reflection? … Why is such debate so absent in Europe? Why does freedom for Iraq not resonate just because it comes from Bush's mouth? Why is Europe's interventionist left, unanimous today about Hungarian freedom, apparently uninterested in Iraqi freedom? If I, an American living in Brooklyn New York, do not have the right to vote in any European country (and rightly so!) what makes a pompous cretin with a bloated sense of worth, like you, think that you have the right to vote in my country? Ironically, as a politico he should know the value of every legitimate, solid, mandate giving vote he’s ever gotten, but obviously believes that it’s only of value to him, and to hell with yours’. With no view of the future or even with a basis in logic or morality, he’s sure that some issue of his matters more than any in the future might have. Like the welfare state that only survives one generation, he’s prepared to put sovereignty in the same dustbin as long as he gets his way. His sniffing and snorting will never get it back if he changed his mind. Inasmuch as official Europe wants people to vote as little as possible, especially on whether or not they willingly want to join official Europe, one can hardly be surprised. In the face of Islamist intimidations, what is the free world to do? Check out Fausta's translation of the article that brought Robert Redeker into trouble. They're preying on our fears again, writes Ben Duffy about the… Republicans (?). Another success for France's state-controlled railroads. Some may wonder, do we mean to rejoice in the death of innocents. No, of course not, but if anybody has been doing so over the years — or at least deriving schadenfreude-type satisfaction from the tragedies of others — it has been the French press. French journalists have always been giving a great amount of attention to the numerous accidents on British railroads as proof of the failure of the utterly inhumane private property system. State-run railroad accidents, whether in France or elsewhere, are blandly reported — with the only emphasis on the humane tragedy, not (as opposed to capitalist-related accidents) on any profound lessons to be derived therefrom — only to be immediately forgotten. Double standards, folks. Double standards. Update: In a slightly-related article, Stéphane examines neighboring Switzerland's state-regualted health system. Whinging about the basic data that airlines have anyway, which is the same data European airlines share with European governments anyway when you fly within the ”holy city of Schengen” through which all the 9/11 hijackers came. Yes you do. Your über-euro-arline/champion keeper of the naotionalist culture already has it. A young girl in Lyon was pelted with rocks for snacking during Ramadan. Thanks to 5 Years Later. Seen in a street market in the village of Nobsa, Columbia. Ché, the mobile phone salesman. Long live the communications revolution! The appointment will see power over EADS's most important subsidiary consolidated in the hands of a single French executive. A similar proposal was fiercely resisted by the aerospace group's German shareholder DaimlerChrysler just over a year ago when it was mooted by the former Airbus chief and EADS executive Noel Forgeard, who left after a share dealing controversy this summer. A complex structure of cross-reporting, with French executives reporting to German and vice versa, has been blamed for perpetuating national rivalries which have contributed to the group's recent troubles. Moreover the personal ambitions of former Airbus executives such as Mr Forgeard have created an atmosphere of mistrust between the aircraft maker and its parent which has affected the group's performance. A different character being a government type taking a mad romp through the carnival ride of this strange new thing called capitalism, excerpt the company is rigged up in such a way that it fail all it wants, but never go out of business. It is understood the French government, which has 15 per cent stake in EADS, agreed to Mr Streiff's departure yesterday afternoon after initially supporting him. However, the deal was reached only after the EADS shareholders agreed Mr Gallois could retain both his EADS role as co-chief executive as well as the Airbus post. Alas, the state is everything, and everything for the state – but there’s another subtext: a fight over the national controlling the ship been getting in the taxpayers’ aft for 4 decades. The Dear Leader’s nuclear test could not have occurred without Bill Clinton’s decade of dalliance. Clinton could have obliterated the Yongbyong reactor with one strike when he first learned of North Korea’s covert nuclear program in 1994. Instead, he allowed Jimmy Carter’s private foreign policy to preempt him. 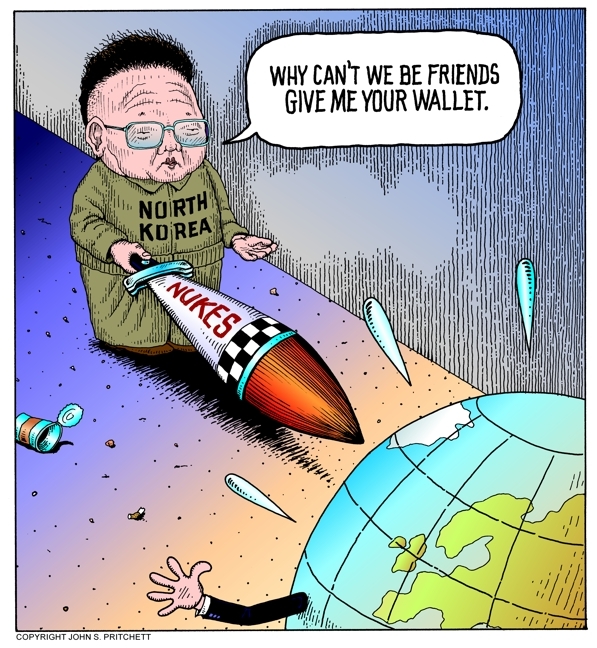 Upon completing the “Agreed Framework” in 1994, Clinton stated, “This agreement will help achieve a vital and long-standing American objective: an end to the threat of nuclear proliferation on the Korean peninsula.” We now know the $4.6 billion bribe gave the Communists the two nuclear reactors they used to create their current arsenal. A victory for leftism, if there ever was one. During 1980, a group of friends who were active in the protests against the Seabrook nuclear power project were searching for a way to make the connection between the issues of nuclear power and militarism. One of our many activities was to spray paint anti-nuclear and anti-war slogans on public buildings and sidewalks using stencils. One of our favorites was to spray paint the words "MONEY FOR FOOD NOT FOR BOMBS" on the sidewalk at the exits to grocery stores in our neighborhood. One night, after an outing of spray painting, we had the inspiration to use the slogan "FOOD NOT BOMBS" as our name. An auspicious start in defacing property, and not quite understanding just what a fantastic job the left has done for the cause of mass starvation and crop failures. The irony is that the NorKs are among the very few people on earth who have had to make a choice between food and bombs, and reflecting on the fact that their ineptness has brought them poverty and were no meaningful threat to anyone, they chose bombs as far back as 1992, and have let their population starve even more since. French Foreign Minister Philippe Douste-Blazy condemned the North Korean nuclear test Monday, saying the international community should take swift action against the Communist regime. "France will turn towards her partners in the Security Council to quickly come up with a reaction," he said. Well, now! THAT should stop that impish little perv! Douste-Blazy waits for the UNSC to react much in the way we wait for him to react – because it’s killer comedy! Where does he get this stuff, anyway? Numberwatch is website created by Prof. John Brignell who has been tracking environmental hysteria and the innumerable phenomena that the non-scientific and incurious attempt to attribute to Climate Change©® to satisfy their need to believe in their own rationality. Take a moment and look at the list. Imagine for a moment that there are people so satisfied by the “Diaboli Ex Machina” explanation of all of these things that they are no longer worth studying (such as yellow fever, for example) because they can be explained away with one of Al Gore’s megalomaniacal stares. Galileo had it easy compared to any scientist or scholar looking for other causes for, say, stress fractures in drain receptors, taxation policy, or happy reindeer, among other things. However it DOES explain one thing: a rise in the number of people with nebulous Liberal Arts degrees making proclamations about science with more certainty than any scientist! I’ll just throw this out there for the sake of equal treatment. Deb Frisch is no better than a child molester. Henseforth her name shall be Queen ASBO. It’s good to keep plenty of booze and dope around the house for moments like these: a Pythonesque white man playing the race card over and over until his audience is numb to it and no longer notices it's own unspoken hatred of people, giving them Step'n Fetchit features not seen since 1928. The likes of Plantu think borders and sovereignty are luxuries only available to 3rd world, "real" countries, unlike the western society that they've done so much to dismantle.the fuse is lit! Short break for some T and A. That attitude has contributed to a subliminal racism among older residents and an inclination for the two communities to keep separate. The ethnic Arabs congregate in one café; the Gallic Frenchmen in another. The ethnic Arabs gather in the shade of trees around the central town square on hot afternoons; the Gallic Frenchmen retreat indoors. When the mayor walks the streets, he reaches out to shake the hands of the old-timers but leaves the ethnic Arabs alone. Thus reports Elaine Sciolino in her NYT article entitled French Farm Town Is Fertile Ground for National Front (which the IHT has — diplomatically — reentitled A French town fears the loss of its soul). Every Bastille Day, the town celebrates the arts and crafts of daily life a century ago. Last July 14, Courtois ran an old-fashioned open-air café. A retired pharmacist ground potions. A baker made big loaves in a communal oven. Residents dressed in period costume sang old French country songs. Children rode ponies. The ethnic Arabs stayed home. The countries at the center of this competition, analysts say, are Britain, which wants to preserve and strengthen NATO, and France, which wants the EU to grow into a more robust defense institution, independent of NATO. "The competition is there," said Peter Schwarz of the German Institute for International and Security Affairs in Berlin. "There is always the tendency by France to try to separate the EU's defense policy from NATO." NATO has repeatedly asked the EU for more civilian and humanitarian assistance in Afghanistan, particularly since both organizations say security cannot be attained without economic development and jobs. But the European Commission has refused. "The Commission put its foot down largely because of opposition from some of the member states," Keohane said. These included Belgium, France, Greece and Spain, EU diplomats said. La Banlieue s'exprime, et elle est analphabète. L'Algérie somme les franchouilles de garder leur racaille chez eux.